Upon first glance, it is apparent this home owner loves color, has sophisticated taste, and an appreciation for things that are unique. 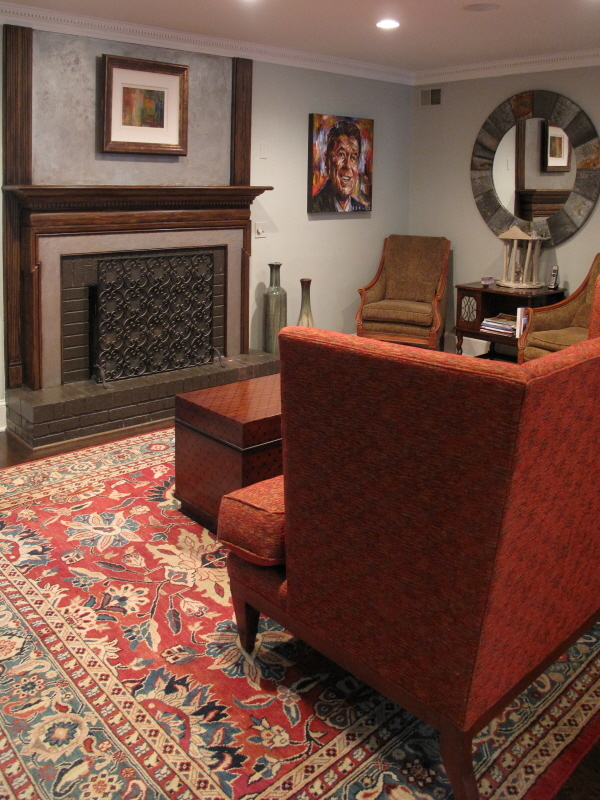 Our goal was to create a sense of warmth in this space through the innovative use of artistic finishes. 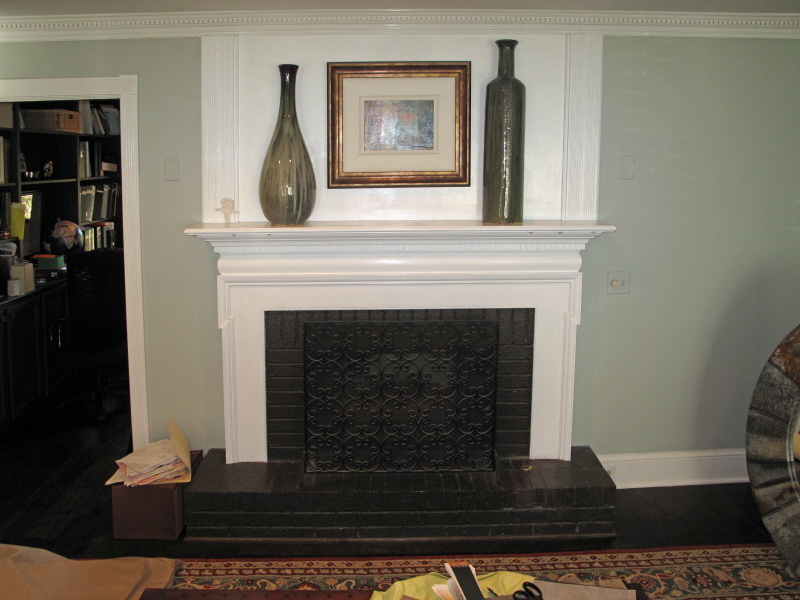 The mantel is the largest architectural detail in the room. Enhancing this element provides a prominent design statement and offers a spectacular feature to compliment the art collection. 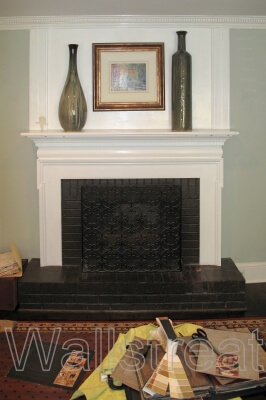 As you look at the mantel, the first observation is that it is wider on the top. This makes the ceilings appear low. Fluting was added to the lower portion of the sides to create straight vertical lines. This simple addition gives it balance on the wall. We also wanted to draw attention to the interesting architectural features within this piece. More than just one faux finish would be needed to accomplish this. The deep rich color of the hardwood floors visually grounds the space. 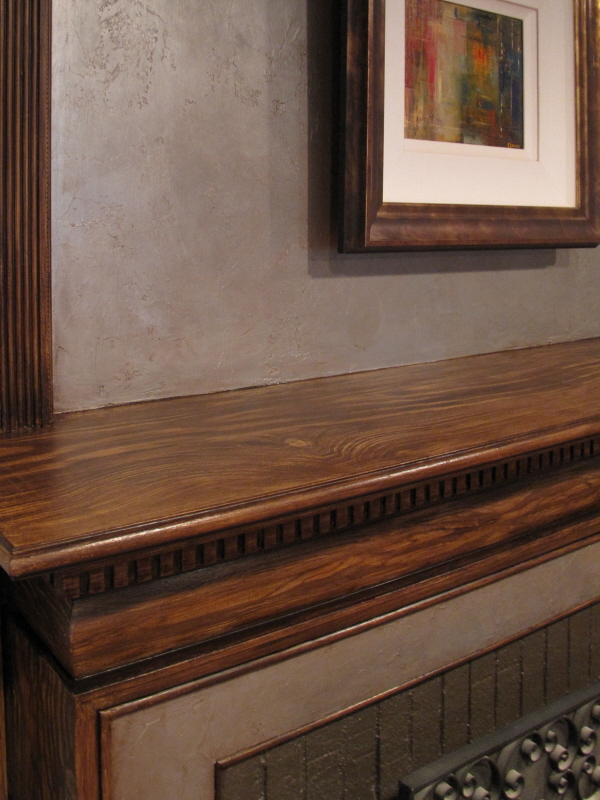 Painting a faux wood grain finish (faux bois) on the sides and along the ledge offers a seamless connection and a bold outline to the mantel. 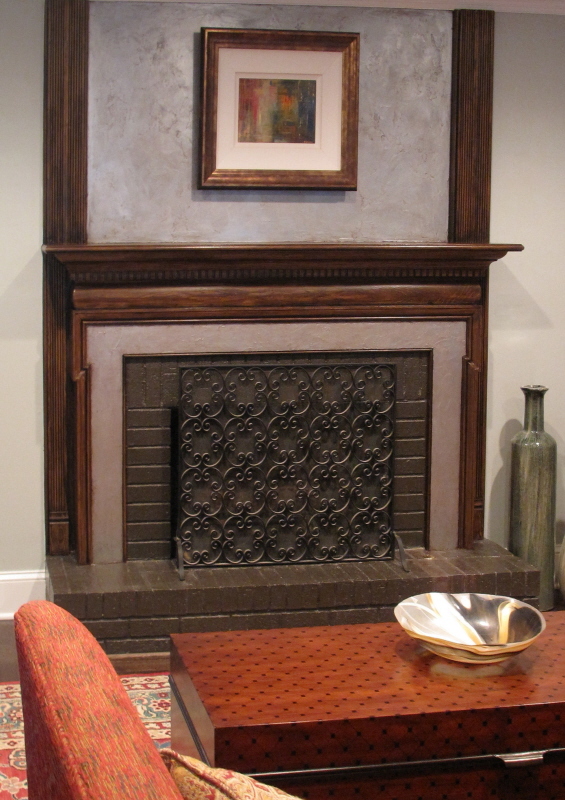 For the interior surfaces, we looked to other artistic elements in the room for inspiration. 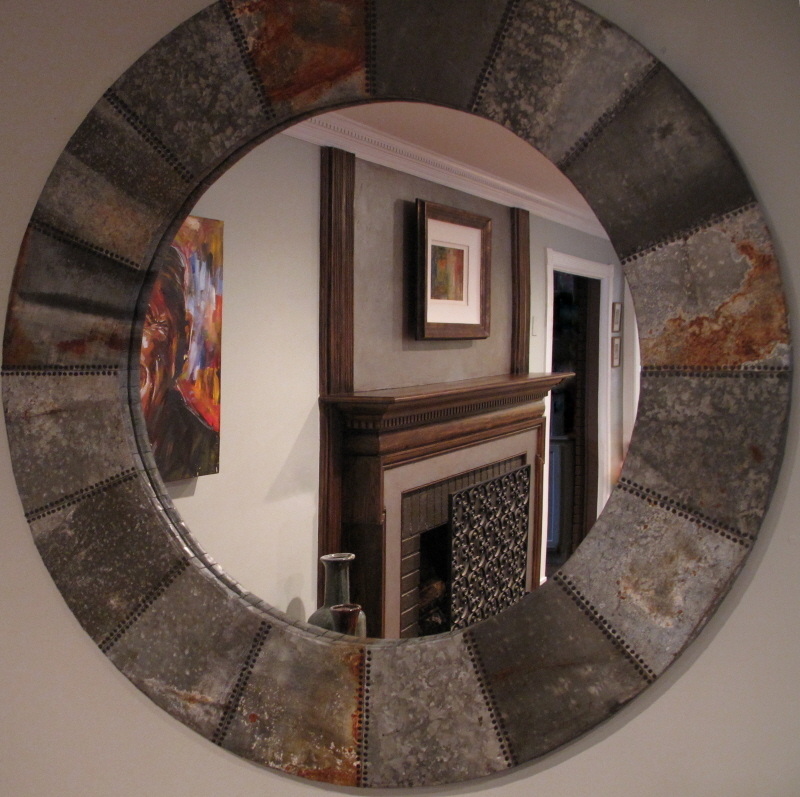 The metal framed mirror stands prominent on the adjacent wall. This was our guide. But, mirrors are tricky. It is important to consider the image you will actually see as you walk by. As you enter this space, notice how the mantel appears in the reflection. That image now becomes an important part of the design. Therefore, we chose to incorporate a subtle faux finish that gives the illusion of textured tin similar to the mirror frame. This unifies the color palate. With the help of the mirror, it has now become art within the art! 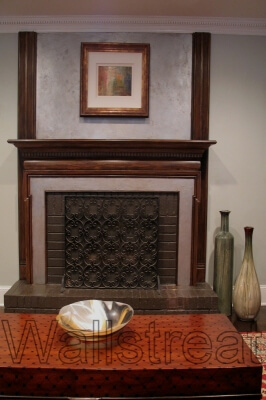 In the end, it is the innovative use of artistic faux finishes on the mantel and clever placement of the artwork that gives this space a sense of intrigue. It is an innovative way to “reflect your personal style”. Special thanks to the creative talents of Joann and Kelly of Kandrac & Kole Interior Designs: www.kandrac-kole.com. It is always a pleasure to be a part of their vision. 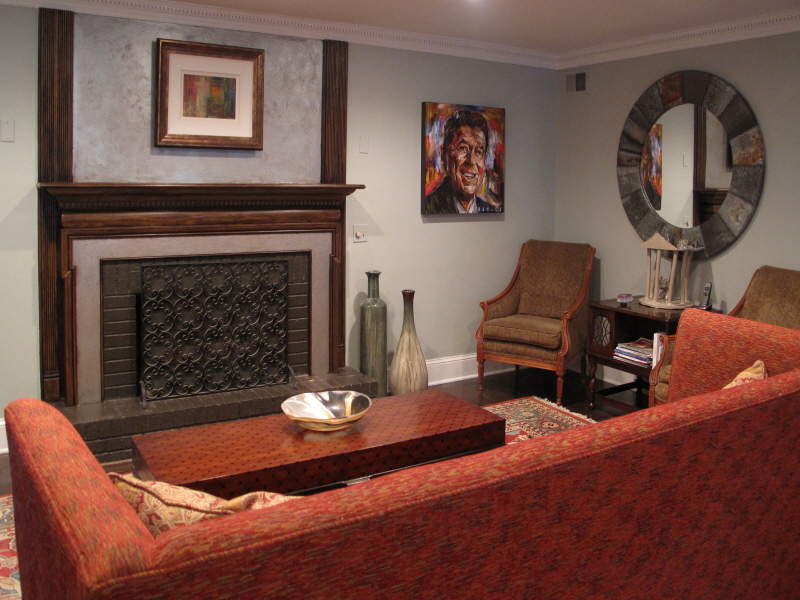 View more decorative painting enhancements by Kass Wilson of Wallstreat Studio, by visiting www.kasswilson.com. We welcome your comments below. Your newsletters not only reveal your clever creative process, your choice of words perfectly complements your artistry. I look forward to each edition’s journey through creative problem solving. Beautiful transformation! You do nice work! Good to see you at the event the other night. Your work is beautiful. I will be in touch. Nice explanation of the process and the thoughts behind it. I like your blog–Sass Lassley suggested I check it out and I’m glad I did!